In the words of the great Kenny Rodgers, you got to know when to fold ‘em. Guys, I’m folding ‘em. I can’t do it. I have tried for a week but cannot bring myself to eat the green peppers. 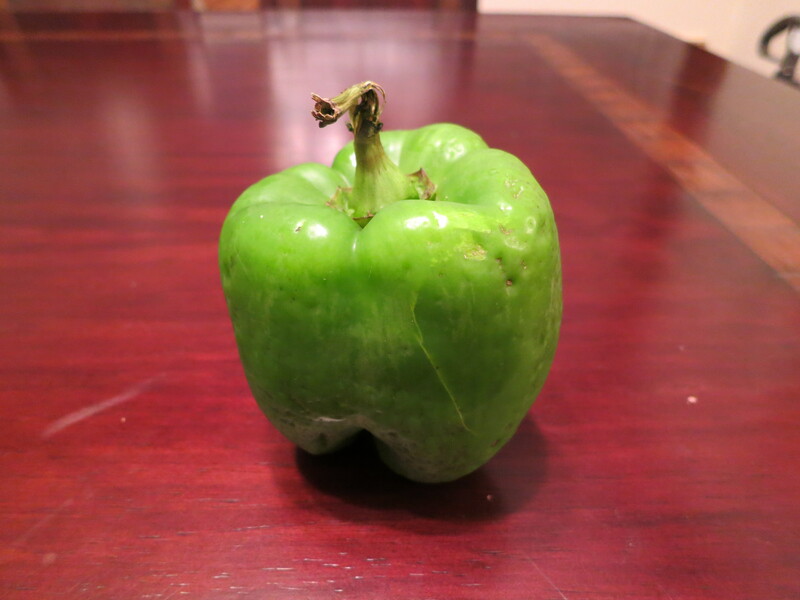 Every time I think about eating the green pepper, I have to talk myself out of ordering pizza instead. The peppers have sat there on the third shelf of the fridge, tucked away in the back, almost out of sight for six days now. Each day, I have looked at them. Each day, they have look back, a gleam on their green skins, as though they know that I will succumb to the pressure. Today, I finally had the courage to admit defeat. The peppers have won. I cannot eat them. Perhaps, as Kenny says, knowing when to walk away and knowing when to run is part of the CSA experiment. I will not like all the vegetables and fruits in my CSA bag. Sometimes, I will have to leave produce on the CSA table. Leaving them there, however, means that someone less fortunate than me can enjoy them. Leftovers are donated to local soup kitchens or homeless shelters. I’d much rather do that than throw away perfectly good food. I’m bummed about the peppers not only because I couldn’t conquer a fear/dislike but also because I wasted food. But, I’ve decided to chalk it up to a teachable moment. In the future, when a pepper or other known enemy crosses my path at the CSA, I’ll leave it there for someone who can enjoy it. Love the title of this post. I also have a hard time with green peppers. I either put them in salads or stuff them (and then usually just eat the stuff inside). I thought about stuffing them but worried that the pepper flavor would infiltrate the innards so much I wouldn’t be able to eat them.